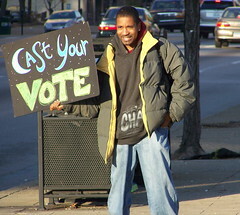 KFTC strives to create an authentic, participatory democracy. We register, educate, and mobilize voters to participate in elections, and we make a space to talk about issues. We want elected officials to be more responsive to all Kentuckians, not just politically powerful interests, and we want better candidates to run and get elected. The current political process is deeply flawed. It's hard for the voices of low-income communities, youth, and people of color to be heard. And the voices of wealthy special interests are often elevated. The system isn't fair, but we work to structurally change it while participating in it. We elevate the decision-making power of those who have the least power now. KFTC registers voters year-round at community events, but we also lead dedicated voter registration tabling events in low-income, youth, and people-of-color communities to prepare people to vote. It often isn't easy to learn where candidates stand on important issues, so KFTC mails tens of thousands of voter guides to members and friends each year and maintains a powerful resource at www.KentuckyElection.org to give voters the opportunity to cast a more informed vote on Election Day. We also host candidate forums and talk with candidates to inform them about issues we work on. Registration and issue education aren't worth much unless we also mobilize people to vote on Election Day. We have a robust campaign every election that includes door-to-door canvassing, mailings, phone banks, community events, email, social media, rides to the polls, and more. Encouraging people to participate in KFTC’s own democratic process and other local institutions like our rural electric cooperatives. Follow the links above to learn ways you can get involved and make your voice heard.